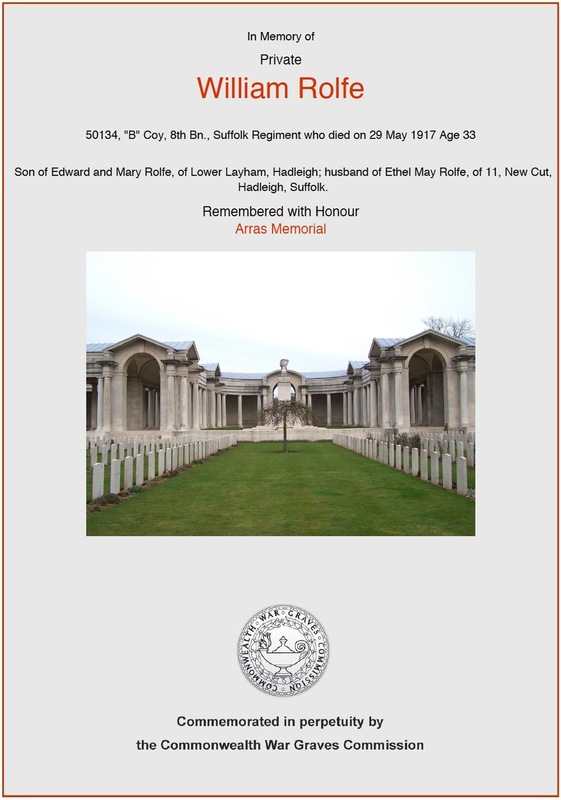 Relatives: Son of Edward and Mary Rolfe of Lower Layham, Hadleigh. Husband of Ethel May Rolfe. Willie Rolfe was christened Willie. The son of Edward and Mary Rolfe of Lower Layham. In 1901 he was 17 and still living at home in Lower Layham and employed as an agricultural labourer. At some point shortly after this he enlisted with the 3rd Bn the Suffolk Militia. He was sent to Dublin when the Militia was mobilised to replace regular soldiers who had been sent to fight in South Africa. He was in Dublin from 14 March 1902 to 26 September 1902. The photo above shows Private Willie Rolfe c.1902 and was taken at T Atkinson's studio in Harold's Cross, Dublin while Willie was serving in Ireland with the Suffolk Militia. Following the cease fire in South Africa the Militia returned to Bury and Willie then attended a succession of summer camps until 1908 when the Militia was abolished and the Territorial Army created. At that time he was put on the Special Reserve. 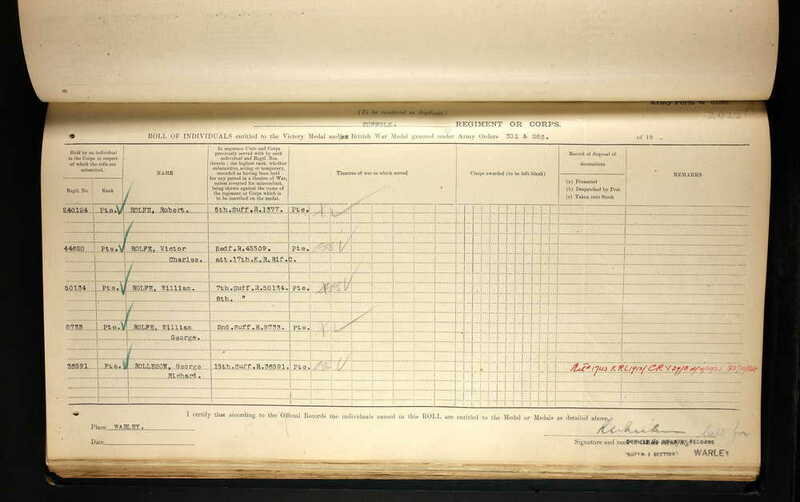 By 1911 he was 27 and back at home in Lower Layham but now working as a horseman on a farm. On 6 December 1913 he married Ethel May Skinner and they lived at 11 New Cut, Hadleigh and they had a daughter on 11 July 1915. At the out break of war a man had to be a minimum of 5 foot 2 inches in order to enlist in the Army and Willie was only 5 foot! However, his height may have been overlooked since he had some past service experience. He joined the 8th Bn Suffolk Regiment. The 8th (Service) Bn Suffolk Regiment were formed at Bury St Edmunds in September 1914 as part of K2 (Kitchener’s Second Army) and came under command of the 53rd Brigade in the 18th (East Anglian) Division. 1 - 13 Jul 1916 The opening phase of the Battle of the Somme. 14-17 July 1916 The Battle of Bazentin Ridge, where the Division captured Trones Wood on the 14 July. 26-28 September 1916 The Battle of Thiepval. 1 October - 11 November 1916 The Battle of the Ancre Heights. 13 - 18 November 1916 The Battle of Ancre. 11 January - 13 March 1917 Operations on the Ancre. 17-18 February 1917 The actions of Miraumont. 10 March 1917 The capture of Irles. 14 March - 5 April 1917 Pursuit of the German retreat to the Hindenburg Line. From 9 April 1917 The Battle of Arras. 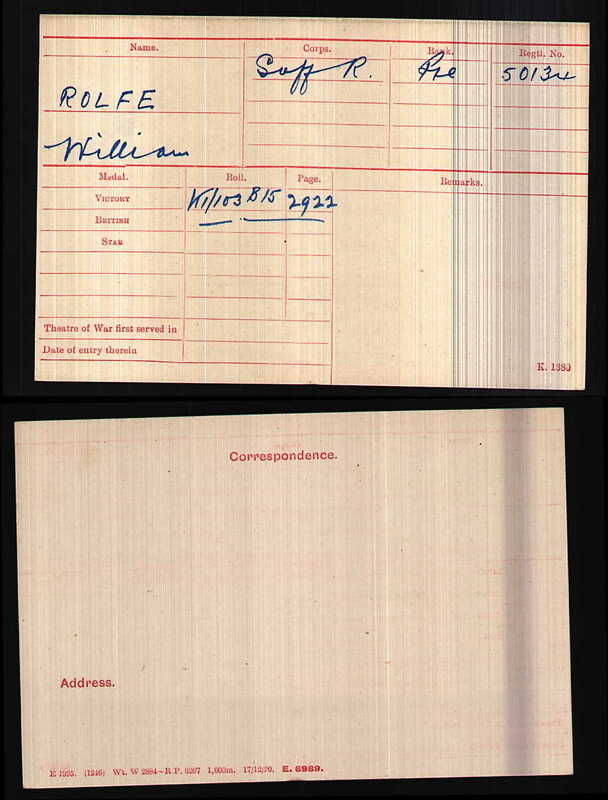 Private Rolfe's was entitled to the above two medals. Although the medals shown are not his original medals. On the 29 May 1917 the 8th Bn Suffolk Regiment war diary reports that there were working parties made up of 12 platoons working in the forward area. The diary also states that on that day there was 5 casualties. Willie was one of these. The first news of Willie’s death came in a letter from a comrade (J A Grimwade) who wrote to Willie’s wife saying “No doubt you will be wondering who can be writing to you, but I scarcely know what to say as it is very bad news I have to tell you, although I take it you have already been acquainted on the matter of your late husband’s death, which I am sorry to say took place last week. Although I know New Cut very well I didn’t remember your husband when I used to work for Mr Sadler”. News article showing letter from J A Grimwade. A further letter written by the battalion chaplain and sent to Willie’s wife explains what happened to Willie. The Chaplain wrote “he was killed by a shell, wounded in the chest and died instantaneously. He was buried by the trench where he fell and a cross marks his tomb”. Willie’s grave must have been lost in subsequent fighting. He has no known grave and is remembered on the Arras Memorial, the Hadleigh Memorial and the Layham memorial. Willie’s older brother Arthur was killed while serving with the 1st Bn the Suffolk Regiment on 22 September 1916. He is buried at Struma Military Cemetery in Greece and remembered on the Layham Memorial, but interestingly not on the Hadleigh Memorial. Willie is one of two men listed on both the Hadleigh and Layham Memorials, the other being Joshua Rowley. The Rolfe family came from Layham, whereas Willie's wife and daughter lived in Hadleigh. In 2016 the War Medal that was issued to Willie Rolfe appeared on eBay for sale by auction. While the Hadleigh Great War Project attempted to purchase the medal, they were outbid. The whereabouts of Willie's medals are currently unknown. We hope that this page has been able to tell the story of Willie Rolfe. If you know of any information which might help to add to the story then please get in touch.